This journal offers an accessible platform for articles and commentary on the epidemiologic and social foundations of public health policy. Continuing a well-established tradition, the journal aims to create a more inclusive public health policy dialogue, within nations and among them. The goal, in part, is to stimulate public health policy debates beyond the traditional boundaries of the health system, to examine the array of forces and environments that impact on the health of populations. 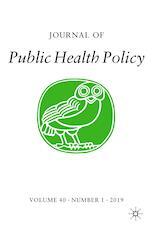 The Journal of Public Health Policy offers an exciting platform for discussing controversy and framing policy debate, and especially honing policies to solve new problems and explore issues still unresolved. The journal publishes original scientific and policy contributions on all public health topics. The result is a lively discussion about how to improve the health of populations and reduce disparities in the delivery, accessibility and quality of public health. Journal of Public Health Policy is abstracted and/or indexed in: CSA Sociological Abstracts, EMBASE, Environment Abstracts, Index Medicus/MEDLINE, PsycINFO, ScienceDirect Navigator, Science Citation Index Expanded, Social Sciences Citation Index. How have toxic chemicals been developed and used by industry and how have communities been affected? A new JPHP special section explores www.toxicdocs.org: the history, the operation, and the anticipated global utility. Read more.